you always say something worth reading. happy festivus joan! I must say, I share your sentiments. Even when life isn't great, it is pretty darn good. May 2017 be equally as good. Ditto! There's so much to be thankful for, regardless of any current situation we might be facing! I'm thankful that you are doing better! Merry Christmas to you and your household! Merry Christmas to you and your family! Hoping 2017 holds many blessings for you, Joan! Merry Christmas, Joan. May 2017 hold fewer unpleasant surprises and many, many more blessings for you, Mike, and your son! 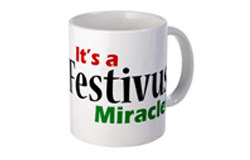 Ah, a festivus for the rest of us! I remember that Seinfeld episode. I'm glad your list of grievances is empty, Joan. Here's to a 2017 with fewer surprises, but may any that come your way be good ones! Wow! I love reading every single thing you write. It is the truth. P.S. Jackie, LOL.